In a world that changes and evolves ever more rapidly – technically, economically and in all kinds of international relations – human beings have a strong need for stabilizing influences. In their constant quest to explore, create and develop, they also need to bring greater order, peace and prosperity to the world. In this seeming paradox, they almost invariably need a known starting point, some ‘rules of procedure’ and eventually a common basis for measuring progress, acceptability and achievement. At the philosophical or intellectual level, these are provided by moral or ethical standards that can theoretically be adopted and applied by anyone in any walk of life. Specifically in technology and science, and therefore in the vast proportion of industrial, business and economic spheres, they are most often articulated in the consensus-based documents published as International Standards or Recommendations by the three truly global standardization bodies: the International Electro-technical Commission (IEC), the International Organization for Standardization (ISO) and the International Telecommunication Union (ITU). These technical standards, too, are voluntarily conceived, elaborated, adopted and applied by users ranging all the way from individuals through companies, professional associations and national governments to regional groupings. They are democratically developed in the widest global perspective, aiming to offer the greatest good to the greatest number. There can be no such thing as an absolute, immutable standard, either intellectual or technical. Like morals and ethics that have evolved and been refined over the millennia, International Standards in the 21st Century are living guidelines and specifications. They must retain a degree of flexibility and be open to adaptation, modernization and improvement, even withdrawal or replacement when changing circumstances, technologies or markets so demand. But to achieve the desired result among the interested parties – whether these be safety regulators, development engineers or competing manufacturers, for example – the standards development process must first allow an essential level of consensus, a stable foundation on which to build an agreed route forward. One vital role of IEC, ISO and ITU standards and other technical agreements is therefore to create an equilibrium, a form of peace, from all the competing technical, economic, social and environmental pressures that make up our modern world. Just as it is easy to be cynical about the chances of achieving global peace and prosperity, it is easy to be sceptical about the consensual base on which international standards are developed, seeing consensus as “soft compromizer” and, therefore, ineffective. In fact, building consensus from starting positions that may be very far apart and held by powerful market players often requires much discussion, vigorous debate and argument, negotiation and, on occasions, confrontation among market players. This by its nature is neither an easy nor in many cases a fast process. But it is the huge benefits, not only for the participants but most importantly for the prosperity and convenience of mankind in general, that drive international standardization forward. The global technical agreements forged in the IEC, ISO and ITU help to set and maintain the highest levels of safety, performance and quality in a vast range of products and services, to ensure their environmental friendliness, to foster technical understanding and technology exchange around the world, and to promote the rapidly expanding business and trade among nations that are a hallmark of our times and the cornerstones of sustainable social as well as economic development. Recognition of the importance of International Standards comes in different ways and forms, and from different sectors of society. At one end of the scale, the fact that our everyday reliance on product safety, the availability of robust communications and a constantly increasing quality of service bears tribute to the value of thousands of unseen standards from the IEC, ISO and ITU. At the other end, the World Trade Organisation’s Agreement on Technical Barriers to Trade emphasizes the vital role played by International Standards in providing the technical foundation for global markets and calls on all governments to make maximum use of them in lowering unnecessary technical barriers to free trade. Without agreement, there can be no peace. And without peace, there can be no lasting prosperity. 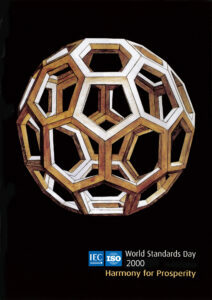 International Standards are an essential tool in mankind’s continuing efforts to achieve more of both.